The CEO of facebook, Mark Zuckerberg who was invited to Nigeria few weeks ago by Nigeria maximum ruler Gen Muhammadu Buhari for a secret meeting in Aso Rock, has turned himself into a cheap willing tool in the hand of a clueless tyrant in Nigeria to be used to fight against the restoration of Biafra. There is a revelation which is contained in an upcoming article which has it that the cause of the poverty and hunger in Nigeria presently is as a result of billions of dollars already spent by Buhari in lobbying left, right and center to stop world powers from supporting Biafra. But how long will Buhari continue to lobby against Biafra? How much did Gen Buhari paid to Mark Zuckerberg in order to engage him in a dirty deal that is likely to consume his facebook if care is not taken. Today has vindicated the outcry of Biafran agitators that the only reason why Mark Zuckerberg was invited to Nigeria by Buhari is to become another willing tool to work against Biafra restoration. However, many organization have at one time or the other wanted to kick against Biafra and later regretted it. No mortal can quench the burning fire of Biafra restoration. Nigeria government through its armed forces has done so many things to stop Biafra moving train and did not succeed. Is facebook ready to taste the venom of Biafran media warriors? No organization whether media or otherwise has waged onslaught against Biafra and did not regret it at last. Facebook has unprecedentedly shut down Radio Biafra London page and individual accounts of IPOB principal officers. 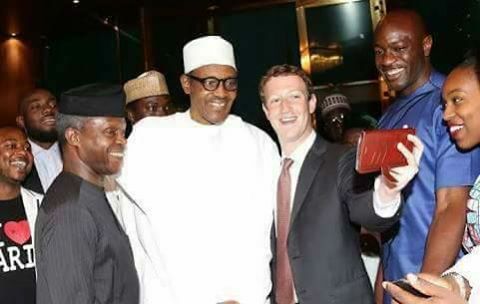 Well, it is not a surprise to us the Biafrans because immediately Mark Zuckerberg was invited by tyrant Buhari, we knew that it is not unconnected with onslaught against Biafra. Is Mark Zuckerberg and his facebook another GIANTS standing against the restoration of Biafra? We Biafrans hereby orders Mr. Zuckerberg to quickly restore the pages and the accounts of IPOB leaders which facebook shutdown or have a mysterious damage from Chukwu Okike Abiama the owner of Biafra project on his facebook. Biafrans are not begging Mr. Zuckerberg to restore our pages and accounts affected by his onslaught but order him to do so for his own good. If himself and his engineers fail to restore IPOB principal officers facebook accounts and our pages, whatever happens to facebook is his own cause and Biafrans will not take responsibility for that. Biafrans know that Buhari has been going up and down trying to block Biafrans from access to media and outright stopping of Biafra agitation. However, the battle to restore Biafra is not ours, it is ordained by God Almighty. If Mr. Zuckerberg like, let him ask Vanguard Newspaper in Nigeria, Ohaneze Ndigbo in Nigeria, MEND terrorist in Nigeria and many others who attempted to be used against Biafra and the shame they received in return. Is Mark Zuckerberg and his facebook ready to wage war against the Chukwu Okike Abiama of Biafra at this hottest period of Biafra struggle? IPOB media warriors known as Family Writers will become completely aware of his readiness for war if he fails to restore our accounts and pages shutdown in the next 72 hours after the publication of this article. Family writers of IPOB will not wish to take our fight against anybody or organization outside Africa except Nigeria government which is keeping us in slavery but should Mark Zuckerberg make himself Biafran artificial enemy, let him be ready to dance the music. The world is our witness that IPOB has not lobby any country or organization to do any evil against Nigeria or support anything that will bring harm to Nigeria govt. The only evil Biafrans committed against Nigeria is the demand for the restoration of Biafra which is our right as indigenous people under heaven. We are giving facebook 72 hours to restore all Biafrans pages, groups and individual accounts which it has shutdown or wait to taste the venom of Biafra. I rest my case because it is only empty drums that make much noise. He is completely compromised Mark Zuckerberg and his hand in this. I can tell by the reduced traffic on Facebook that it is not the same since he has gone there and since the internet handover. Let him have it your wrath! Do not hold back! THE ACTIONS OF MARK ZUCHERBURG,A JEW FROM GREEK IS CALLING ON THE BIAFRANS (SAME JEWS FROM AFRICA)TO RISE TO A CHALLENGE. WHAT MARK ZUCHERBURG DID NOT KNOW IS THAT SAME SECRET HANDED DOWN BY ABRAHAM IS INTACT IN US THE BIAFRANS.THIS CHALLENGE FROM A MORANO LIKE MARK WHOSE TECHNOLOGY SECRET IS KNOWN TO BIAFRANS FROM THE BEGINNING HAVING COME FROM THE THIRD ANGLE CALLED YETZIRA/CREATION WHILE BIAFRANS ARE FROM THE ATZILUT/INFINITE. SO,THE WISDOM BEHIND MARKS FACEBOOK IS WITH THE BIAFRANS AS THE WONDERS OF BIAFRANS IN ICT,SCIENCE/TECHNOLOGY AND THE WISDOM OF THE SECRETS HIGHLIGHTED BY THE SAGES AND SEALED IN SO MANY SOULS IN BIAFRALAND AT THIS MESSIANIC AGE IS REAL. MARK ZUCHERBURG,YOUR WAR IS AGAINST THE LORD/HASHEM BUT BE REST ASSURE TODAY,28-10-2016 THAT BIAFRANS SHALL OPERATE FROM THE HIGHER WORLDS NOT KNOWN BY MARK AND FACEBOOK YET WE SHALL REMAIN UNDER HASHEM AND NOT THE POWERS OF SATAN OR OCCULT. YES,BIAFRANS SHALL DESPLAY THE WONDERS OF GOD OF JACOB(AS THE GAD'S HOUSE)AND MARK AND LIKES WILL BE SHOCKED SINCE THE LORD HAS SENT HIS SPIIT/RUACH TO OPERATE ABOVE MARK AND ALL WORKERS OF INIQUITY WITH PHAROAH MBUHARI. AS THE LORDS LIVES,THIS PROMISE STANDS ON OATH! BIAFRA LIVES!! THE LIGHT OF ISRAEL COMING OUT OF AFRICA FOR THE GLORY,HONOR OF GOD OF ABRAHAM.4RM THE BIAFRAN RABBI. Zuckerberg, you're a big fool! What did you gain from this individeum calls Buhari? What you are loughing for? Shame on you idiot. My facebook account has been closed from today. Please, all of us must do so.